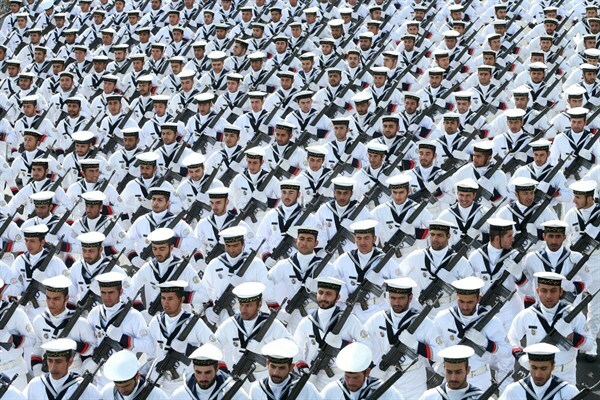 Iranian navy troops march in a parade marking National Army Day outside Tehran, Iran, April 18, 2015 (AP photo by Ebrahim Noroozi). In the years leading up to the Iran nuclear deal, Iran and China found their interests at times aligning and at others diverging. Since the late 1990s, China had reduced its defense ties with Iran under U.S. pressure. At the same time, espousing a discourse of peace and cooperation, Beijing did not want the West to go to war with Iran. Moreover, Tehran’s perseverance in the face of Western efforts to isolate Iran was a counterbalancing force against U.S. hegemony in the Middle East, which suited China’s strategic interests.